Welcome to my weekly series: Book Club Picks. This week, I'm sharing some fiction and nonfiction books that all revolve around World War II. These books cover several different aspects of the war, from the Germans storming through Europe, to the Japanese in the Pacific, to the effect of the war on Japanese-Americans in the United States. 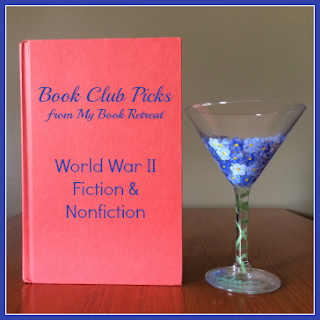 Book clubs can explore the many ways this war impacted people around the entire world. Note about the links below: My reviews do not include spoilers, but the discussion questions do. The book covers are Amazon Affiliate links. If you use those links to make a purchase, I will receive a very small commission but your price will remain the same. This nonfiction account of Louis Zamperini's experience during World War II is truly amazing. Book clubs can explore the details of the war in the Pacific and the role of the Japanese in the war. They can discuss Zamperini's resilience after a plane crash, being stuck on a life raft and then locked up in a POW camp. His life and experiences during the war will provide book clubs with plenty to talk about. This is a more lighthearted WWII novel than most, although it does feature some harsh, sad topics. The overall mood is lighter and the story is heartwarming. Book clubs can discuss how the people on the island of Guernsey persevered during the German occupation of their island. Discussion can also revolve around the writing style as the novel is composed entirely of letters. It also has a nice tie-in with book clubs since it is about a book club! This is a painful novel to read, as it deals with the roundup of Jews in France and focuses mostly on the children. Book clubs can talk about France's involvement in the roundup, a topic that isn't addressed in many novels. Discussions can also revolve around the difficult topic of the children who were taken from their families and the atrocities they faced. This novel takes us into the heart of Asian-Americans during World War II and the difficulties they faced as the Japanese became the most hated enemy of the country. Book clubs can discuss the way Japanese-Americans were treated at that time and the internment camps they were forced to live in. They can also talk about the struggles between different generations and their divergent beliefs. This young adult novel has become a popular WWII story. Told from the perspective of Death himself, this novel offers book clubs the chance to look into the lives of the Germans who were sympathetic to the Jews during the war. Book clubs can also discuss the many relationships between characters and the effect of the war on them. The writing style itself can also be discussed and critiqued. Have you read any of these books about World War II? What are your favorites from this time in history? Next week, I will be sharing some middle grade fiction books that would be great for a summer reading group for kids. Please let me know if you have suggestions for other topics to cover, or if you would like to write a guest post for my Book Club Picks series. I'd love to hear about your book club or your favorite books for discussion! I've read The Book Thief and The Guernsey Literary and Potato Peel Pie Society, but my favourite WWII book of all time is The Diary of a Young Girl by Anne Frank. I think it's something that everyone in the world should read, whether they enjoy books or not. It changed the way I think about the world, and I just think it's very important. That's a great point. I haven't read The Diary of a Young Girl since I was a young girl myself. I figure my son will be reading it within the next couple years, so I will definitely re-read it along with him. I read The Book Thief with my book club and then saw the movie. I liked the movie better, my daughter liked the book better. I haven't seen the movie yet. I'll have to watch it! These are all great choices! The only one I haven't read yet is Sarah's Key, and it is waiting on my shelf - need to get to it soon! I'm glad you enjoyed all of these. Sarah's Key was tough for me because it's so focused on the children. But it's definitely worth reading.